Forsan Ceramics’ manufacturing facilities ... advanced. And driving this ambitious plan forward is the company’s CEO Dr Khater Massaad, who brings years of experience in the industry to Forsan Ceramics. Based in King Abdullah Economic City, Rabigh, the company recently started production of sanitary ware, followed by wall tiles and then floor tiles at the end of last month (December). 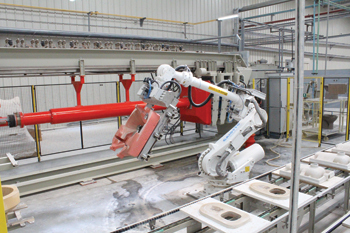 Forsan Ceramics intends to achieve full commercial production of sanitary ware, wall and floor tiles by the end of this month (January) – all in three shifts. The company has acquired a 1.5-million-sq-m of plot of land on a long-term lease with an option to purchase. 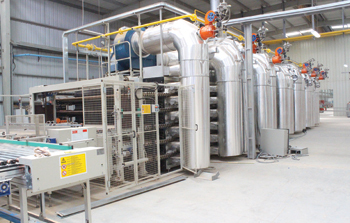 The complex allows for a tenfold increase in production to meet future demand. Dr Khater, who was the former CEO of RAK Ceramics in the UAE, says the facility at Rabigh will be able to annually produce 12 million sq m of wall tiles, 8 million sq m of floor tiles and 1.5 million pieces of sanitary ware. An investment of SR500 million ($133 million) has gone into the facility, which is well equipped with the most sophisticated machinery, all imported from Italy. Forsan Ceramics is now poised to reap the rewards of its efforts, having already received its first order from a client in the UK. Armed with a well thought-out strategy, Dr Khater is undaunted by the level of competition in the local and global market. Speaking to Gulf Construction, he says the company has a competitive edge in that it has commenced production with machinery and techniques that are state of the art. “We are employing the latest technology, best possible machinery as of today, the best designs and best raw materials,” he says. Forsan Ceramics, he says, doesn’t want to cut corners but wants to build on a long-term strategy to be a serious, high-quality producer of ceramic tiles and sanitary ware. Last year, Saudi Arabia imported 150 million sq m of tiles (both wall and floor). He adds that the consumption of tiles worldwide is over 8 billion sq m per year and this is growing annually by 100 to 200 million sq m.
“The developed countries consume up to 3 to 4 sq m per head per year, with countries like Italy consuming 6 sq m per head per year; Saudi Arabia, 10 sq m per head per year; India, 0.5 sq m per head per year; and China, 1 sq m per head per year. “So as long as there are these levels of consumption, it is not difficult to sell 20 million sq m per year,” he points out. Dr Khater does not focus on other producers but on what the market needs. “I think about what the market requires and what I should produce in order to be the best in that market,” he explains. “We will select the most important and long-term markets. We are not interested in one-shot sale. We want to create a good and long-term network for selling our production,” he says, pointing out that with a port just 5 km away the company can export to “virtually anywhere around the world”. Another key area of focus is human resources. “Our philosophy is to create a strong and long-lasting team,” he says. Forsan Ceramics plans to employ 1,200 people. It has opened a training centre for Saudis and intends to achieve a Saudiisation level of 50 to 75 per cent. Among future developments, Forsan Ceramics plans to launch construction this year on a faucet factory, which will be able to produce 500,000 faucets per year. This facility will be part of its Rabigh complex housing the other lines for tiles and sanitary ware. Other businesses might be added later. “This is our first investment and we intend to optimise our products and build a good reputation,” he concludes.